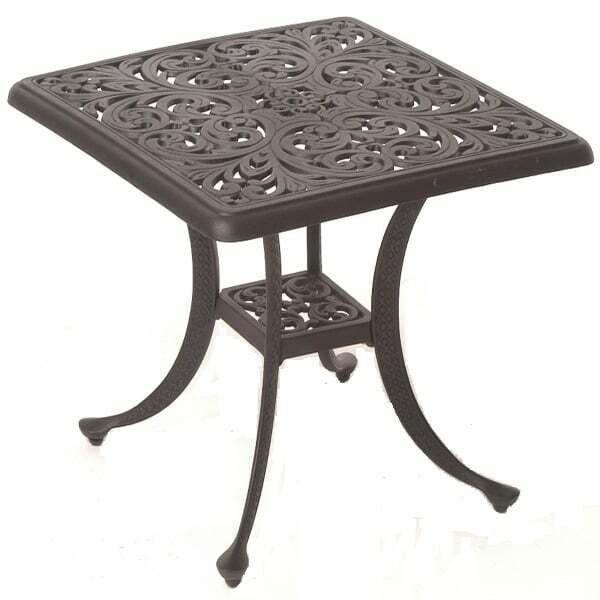 The Chateau Square End Table from Hanamint showcases beautiful etchings and carvings set within a strong and durable cast aluminum frame. The overall layout is coated with design elements taken from centuries-old European motifs. This attention to detail can be seen in the wonderful table top and intricate diamond pattern found in the legs. Hanamint offers durable patio accessories finished with a five-stage powder coating that is all-weather, and will stand up to any environment. Hanamint is so confident in this table they back it with a 10-year warranty.